Take the N12 from Johannesburg to Witbank, which joins the N4, go past Belfast and take the SECOND turning into Machadodorp. 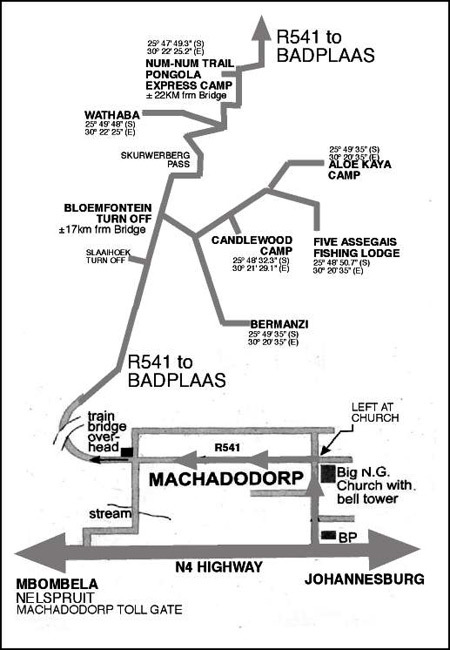 Go into town over the river and get to a 4 way stop by the FNB, turn LEFT on to the R541 to BADPLAAS. Follow the road for 17.5 kilometers and take the BLOEMFONTEIN turn of to the RIGHT for the lodge, Candlewood and Aloe Kaya. This becomes a gravel road, go for 2 kilometers to the T-junction turn LEFT and follow the signs to your destination. For PONGOLA continue straight past the Bloemfontein turn off and continue down the Skurweberg Pass to the camp on your left. FIVE ASSEGAIS ESTATE: S25˚48.985 E30˚22.282.